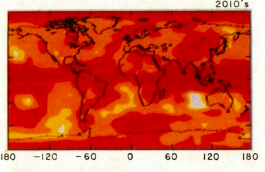 Celebrating the 30th anniversary of the 1988 publication of Global climate changes as forecast by Goddard Institute for Space Studies three-dimensional model Hansen, J., I. Fung, A. Lacis, D. Rind, S. Lebedeff, R. Ruedy, G. Russell, and P. Stone Eli along with others (like Gavin Schmidt, Nick Stokes and others) Eli went back and took a look at what had been discussed in these parts as well as those. There are a lot of very good people who contributed to that paper, so it henceforth hereabouts shall be known as HFLRLRRS. One of the most important things is that the current discussion focuses on the predictions of forcing as well as outcomes. The first is more or less ecomonics, the second physics. It shows that many details in emission scenarios are unimportant, or rather that false estimates in one direction are most likely going to be cancelled by false estimates in the other for a different forcing agent, and that on average the scenarios should be useful for larger periods. 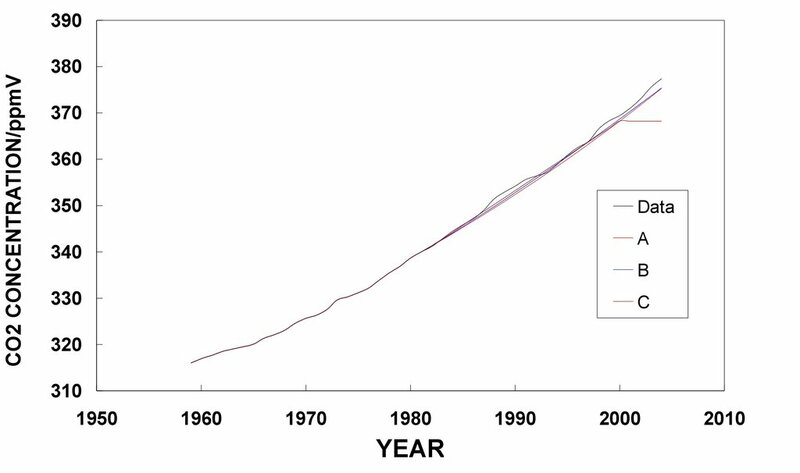 Arctic amplification is clear in the model and 30 years later in the observation. Otoh, the Antarctic in the model is clearly too warm as is the Arctic south of Greenland. The third pole (the Tibetan Highland is too warm also. It would probably be better to map out more of the current decade wrt the El Nino - Southern Oscillation, 2016 being a monster El Nino, but the period also includes about a year of La Nina. Another, not remarked much upon thing is that HFLRLRRS calculated the temperature change compared to the interannual variabilty of their 100 year control run. The change is everywhere (with the exception of the Indian Ocean off Perth) positive compared to the null of the control. What would be interesting (to Eli) to compute would be the model interannual variability for the 2010s compared to that of the control run. Indeed were Eli in charge, CIMP runs would include such a metric. Some groups include O2 (ozone) which gives a CO2e somewhere north of 500 ppmv today. 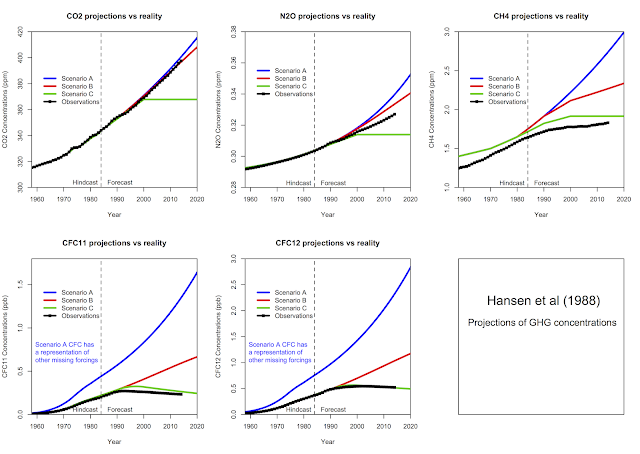 "Second, applying a post-hoc bias correction to the forcing ignores the fact that converting GHG increases into forcing is an essential part of the modeling." Which actually supports making a forcing correction, use the forcing that actually happened, not Hansen's higher than actual forcing estimates. As the models are quasi-linear to begin with in the 1st place. What would be interesting (to Eli) to compute would be the model interannual variability for the 2010s compared to that of the control run. You might find this interesting: Yettella, et al, 2018, "An Ensemble Covariance Framework for Quantifying Forced Climate Variability and Its Time of Emergence". Nice job- Eli, but why nobody calls liinear extrapolations eeiry when they beat apocalyptic predictions on accuracy is a semiotic puzzlement. 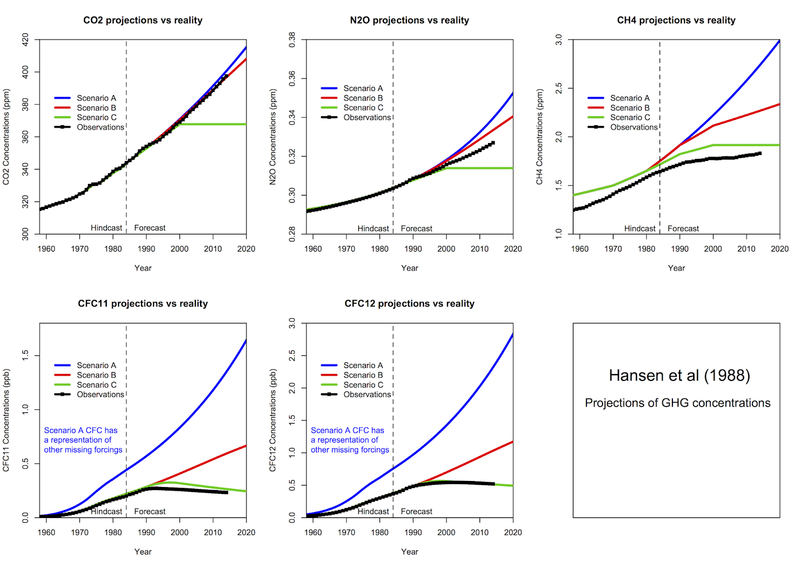 How do Hansen et al's projections compare with projections made by others around the same time? Did any of the folks sometimes described as deniers make any public projections or forecasts?